Original research papers in the areas of combinatorial optimization and its applications are solicited. In addition to theoretical results, we are particularly interested in submissions that report on experimental and applied research of general algorithmic interest. Special consideration will be given to research that is motivated by real-world problems. Experimental and applied papers are expected to show convincingly the usefulness and efficiency of the algorithms discussed in a practical setting. The submission should contain a scholarly exposition of ideas, techniques, and results, including motivation and a clear comparison with related work. The length of the submission should not exceed 15 pages in LNCS style. Submitted papers must describe work not previously published. They must not be submitted simultaneously to another conference with refereed proceedings or to a journal. We regard the following case as a simultaneous submission. Submission of drafts which contain the essentially same results from papers under review in other conferences or journals at the moment of the submission. Only electronic submission (pdf) will be allowed via the Springer Online Conference System (OCS). The conference proceedings will be published by Springer-Verlag in the Lecture Notes in Computer Science (LNCS) series. 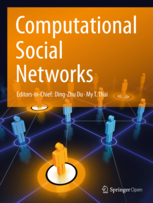 After the conference, some selected papers will be published in special issues of Theoretical Computer Science, Journal of Combinatorial Optimization, and Computational Social Networks.